Need help with settings? and or STL help. Posted May 18, 2018 · Need help with settings? and or STL help. So fair warning, I am totally new at this so, optimizing settings is way out of scope for me currently. 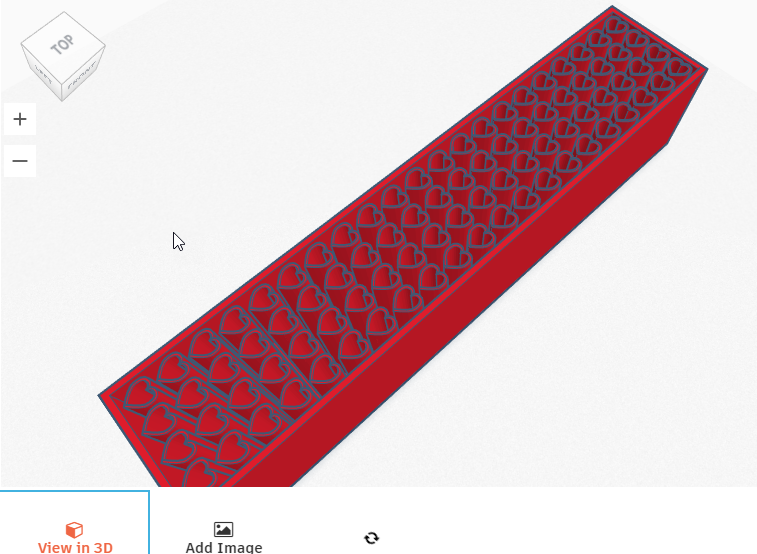 Short version is, I am trying to model something in TINKERCAD, and then 3d-print it. I did everything I though I needed too, and Cura is reporting the print job will take 12 hours. someone over at Thingyverse said he loaded my STL and its reporting only 2 hours. I am using Ultimaker 3.3 and using a Anet A8. I wouldnt care too much if it was 2 vs 3 hours, but 2 vers 12 thats a lot! The design I am aiming for is to print an object that is 1" x 1" x 6" kind of like a baking tray, I want to print things inside the "tray" then pour in colored epoxy, and turn it on a lathe. I have seen it done successfully with simple lines., but I would like to make more complex shapes. 1 - are my settings ok? and is it just because of what I did in the model? 2 - is there a better way to "fill in the gaps? I basically placed all the hearts and just dropped blocks around it to fill it in. then grouped them. I am looking for any and all recommendation and help. Next time please include a photo of your part. I'd go to 0.2mm layers. That should save you a ton of time. And I'd probably print it slower and with 0% infill. Default settings for me in cura said 7 hours. That was with .2 layers, 10% infill, 3 shells (you have 2 which is plenty) and print speed at 30mm/sec (all print speeds). 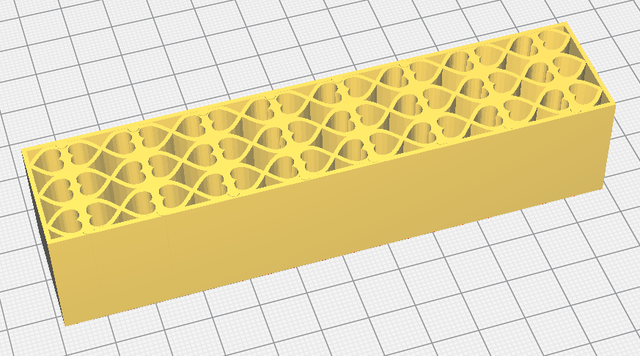 To get this down to 2 hours you could maybe use a 0.8mm nozzle and do one pass on the walls with 0.3mm layer height. And maybe increase the print speed to 40mm/sec. 0.1mm layer is not going to increase the quality much if at all. You'll probably get a better quality with 0.2mm layers and a slower printing speed. Oh and avoid cura 3.3.1 - it has a combing related bug that makes printing slower. Stick to 3.2.1 or 3.4 when it comes out. ".when I run that through the Makerbot Desktop slicer (0.3mm, 10% infill, 2 walls), I get 2hrs 46mins,"
its the difference in time that had me wondering if maybe I have incorrect settings. I also realize that my STL file is throw together quicky and quite probably could be more efficient, but I am so new at this, I dont know how to "fix" the file to be faster. 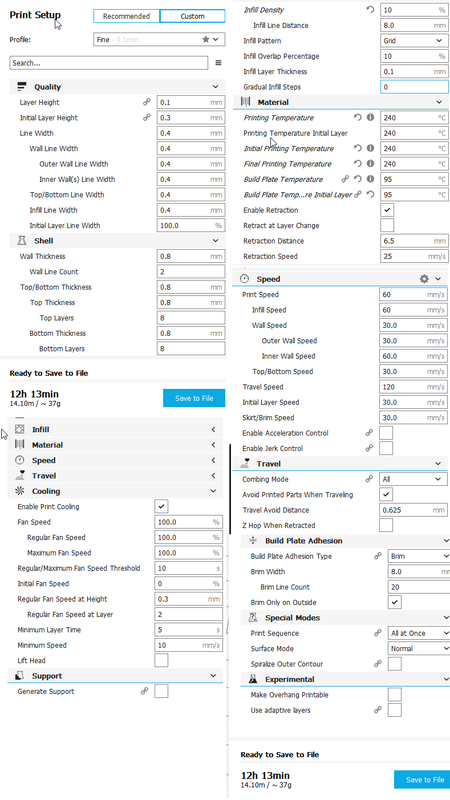 Since I am using Cura, I thought maybe you smarter people would have insight. good to know. I am going to revert back to 3.2 (any guesstimates on when 3.4 will be out?) I didnt realize there was a problem. The bug in 3.3.1 doesn't cause bad quality parts (unless they are large hollow cylinders) and typically only increases print time by 10% so it's not all that serious unless you are on a hunt to get the fastest print time without losing quality. .when I run that through the Makerbot Desktop slicer (0.3mm, 10% infill, 2 walls), I get 2hrs 46mins,"
The 0.3mm layer height is the key point here. Also the makerbot slicer isn't as good at predicting actual print times as cura is. Going from 0.1mm layer height (your setting) to 0.3mm layer height (his setting) should give you a 3x speed increase right there alone. The other major issue is probably how makerbot slicer predicts print times. We set the print speed in these slicers and the slicer tells the printer the speed. However these printers have accleration limits. So for a large part with lots of long straight printing paths (or only slightly curved) it will run at full speed. But for your print with many short line segments to print the printer often never even gets up to full speed. Cura is better at predicting this (for a Um2 - which has acceleration at 5meters/sec/sec). On your particular printer the acceleration might be even lower and you may find that your printer is significantly slower than cura predicts. For UM2 printers it is amazingly accurate on the print times. Posted May 19, 2018 (edited) · Need help with settings? and or STL help. B) Same size, etc? Without settings and full tech info, you have no idea what it will be or look like in print.